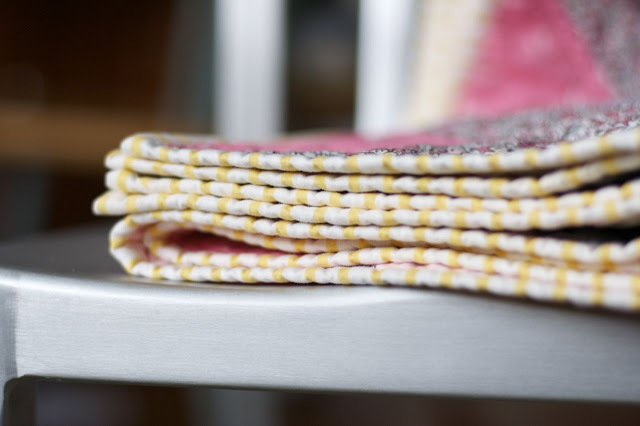 I fell in love with this line of fabric months ago when Sarah Jane first posted it on her blog, and I immediately knew I wanted to make a quilt for my baby. I went with one of my favorite patterns, the zigzag, and I think it worked out perfectly. I used the map panel on the back, along with some Mendocino mermaids, which I think work so well with this line. 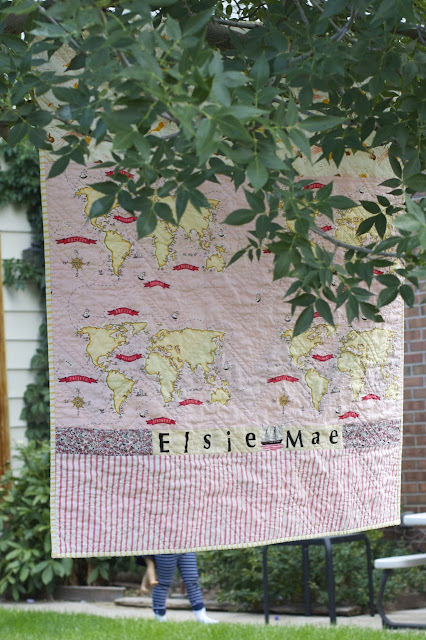 but my favorite touch was the addition of my daughters name, Elsie Mae, I have had this letter fabric for years, with intentions of using it, but I ALWAYS forget. I'm glad I didn't forget this time. I love it! Bound in one of the Out to Sea stripes. I love stripes! I had leftovers, and cut a couple kits for this quilt. They are available in my shop. The kit is for the quilt top only. Super cute Net. All your quilts look so soft. Super cute Nettie....I love the colors for a little girl! Love the way you pieced the backing together...it's another quilt by itself! It is a lovely little quilt. So girly! This is so sweet! I have been wanting to make a quilt for my newest grandson. This would be perfect! I might have to, um, copy you (with proper credit of course). Her name on the back is the perfect touch! i LOVE her name on this quilt. It's perfect. Yay! It's always so fun to see one of your quilts! Pretty, pretty. And I LOVE the name on it - how special! How cute. I love the name! So pretty and the addition of your daughter's name is perfect. 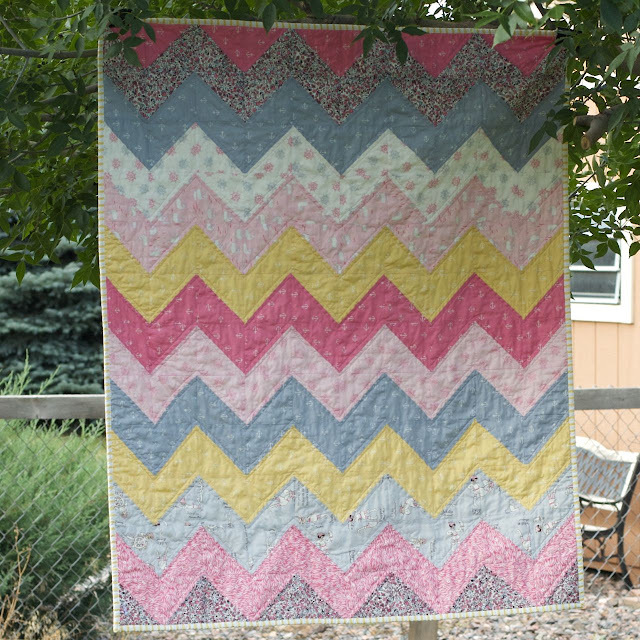 Love love love the zig zag quilt! I have had your other zig zag pinned for quite a while and I have been meaning to ask you if you have a tutorial for this quilt. Thanks! Oh, letter fabric. How cool! They should be still printing that. That is a beautiful quilt! Love the letters, that makes it so special! This is really beautiful! I love the tiny anchors on the pink fabric, the map on the back, and of course the name as well. And who doesn't love a good stripe? Good job! Wow, you got that out fast! That fabric barely came out. How cute. I think the back is my favorite, especially the letters. Love it. Oh I love it. And I adore the back. The out to sea fabric is perfect. I love this line too. I am still undecided on a pattern but I love your zig zag. this quilt is perfect and i love the back as much as the front. 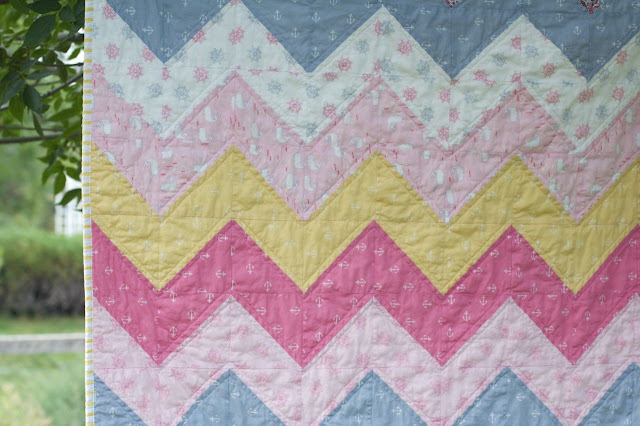 I have wanted to make a quilt with your zigzag pattern for a couple of years. i think it needs to move up on my priority list. The pattern is perfect for this line. hi i spent a long time reading back through your blog, and i just wanted to let you know i love everything you have done! you have a great eye and a wonderful knack for fabrics! Beautiful! The back is as nice as the front!!! İ love this quilt so much. Perfect! I love this delightful quilt! 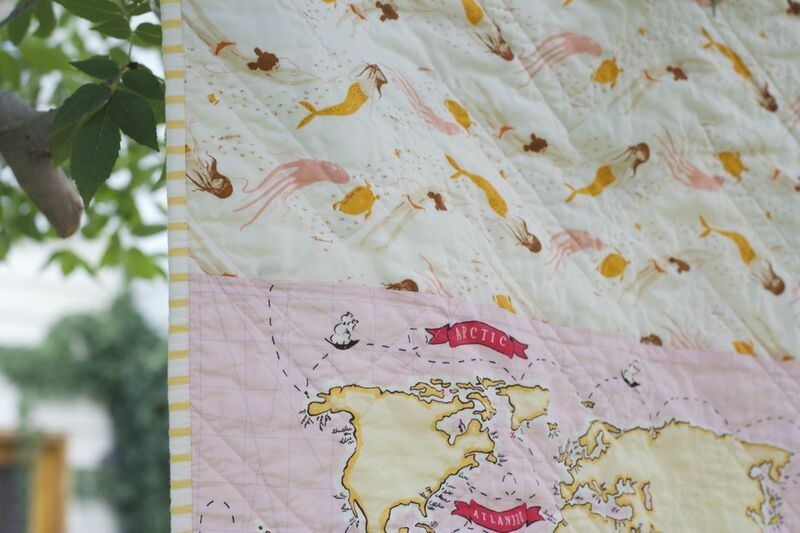 The out to sea fabric is so pretty, and I love the lettering spelling out your sweet baby's name! This is beautiful, I love the colours, it looks like rippled ice cream! I looooove the name on the back. Perfect touch!